$44.00US Funds postpaid & includes index up to 1899. List Elders of Zion Church, ordained period from before 1833 to 1956. 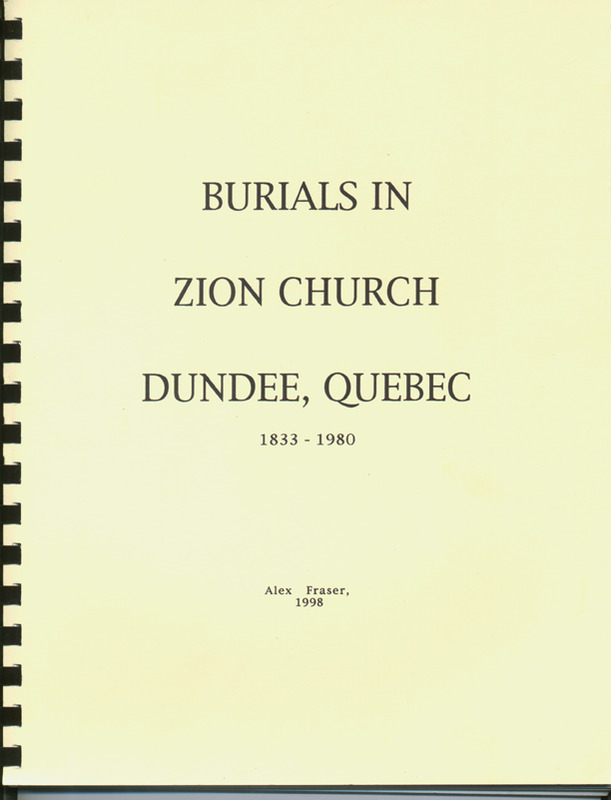 This list of burials is an attempt to supply omissions in the list of Burials Recorded in the Zion Church Register, for the period 1827 - 1964. List names of local residents added as supplement to the index of Stanley Arnold for years 1966 - 1980. It was apparently done by a Stanley Arnold in the mid 1960's and was in part updated in the early 1980's to 1980. I have had a copy of this work for about 15 years and although I am not certain, I think I got it from a Mr. Armstrong. The copy I got was a copy of a copy of a copy and recently I scanned it all 75 pages into my computer. I am now in the process of making a complete name index. What is included here in the index is part 1, and part 2 up till the end of 1899. This, amounts to over 1120 entries. The rest of part 2, 3,4 will get done in time. Any Duplication of names will not be fine tuned until after the complete index is done. Feb. 13, 1894 Hugh McKinnon,	68 Builder of Old Zion Church. Uncle of Hugh McKinnon C.N.R. Conductor. Reading from left to right this index shows	Surname	Christian	Age	Date	Page	Location	Notes. In these heading no age is available if there is an 'R' following the year. Likewise where there is no location available you will find a '??'. of over 1120 entries, you will find duplication of names when more than one member of a family died. Page # refers to the scanned copy I made of this work and as such has no relevance to this web page or the original photocopy version. The main area of coverage seems to be in the St. Agness de Dundee area, but also includes references from Charlottenburgh Township, Glengarry County to St. Anicet, Huntingdon and Fort Covington and surrounding area. In the time period of 1833 - 1899 the following cemeteries are mentioned. Aubrey Cemetery; 1/2000 Directions--at the Fort Covington border crossing, take the right hand fork, Dundee Centre Road. About 1 1/2 miles on your left you will see the cemetery, small, surrounded by metal fence, with a sign in the front that states "Aubrey ". It is almost in the front yard of a white farmhouse. Very well kept up by Fred Armstrong and family, his son still lives in Peter Aubrey's house. Clark Cemetery; 1/2000 Directions--Go past Murchison (becomes Chemin Neuf). Continue until the road ends at a T-intersection, and turn right onto Mtee Cazaville. Take your first left onto Ch. Leahy. The cemetery is on the left after the first house. It is surrounded by a low stone wall and overgrown with trees, but next to the road. Isle of Skye Cemetery;. 1/2000 Directions--Go past Zion church and take the first left onto Murchison. Stay on this road until you see the cemetery on the left, just before it ends at the wildlife sanctuary. Zion Church Cemetery; 1/2000 Directions--Continue on down Dundee Centre Rd about another mile, you will see Zion on the right. The old cemetery is across the road, the new cemetery is to the right on the cross road, about 1/4 mile on the left. You can see it from the corner. If any viewer can provide me with the exact location of these cemeteries, I would welcome that information, which can be added to the above list. Thanks to Suzanne Mackey, Schenectady, NY for the above directions to the Aubrey, Zion, Isle of Skye & Clark Cemetery. Make cheque or Money Order payable to Alex W Fraser and request ordering instructions.